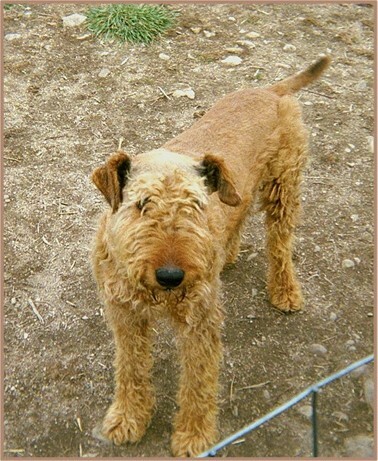 Photo above of Tonka, large red Airedale born in 2004. Extremely cheerful and mellow, Tonka stands 29 1/2 inches tall at the shoulder. 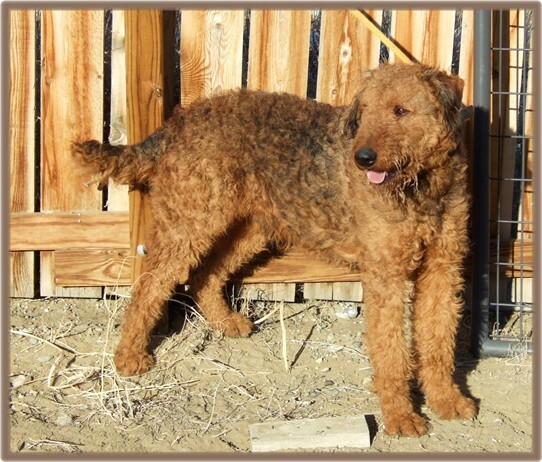 The jolly fellow possesses a very easy to maintain coat characteristic of many of our Airedales and has never been trimmed. 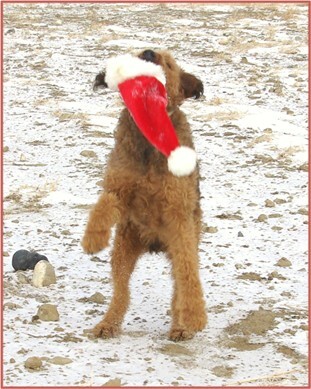 Photos of Tonka and Fancy's Kateybug puppies may be seen on the New Airedale Cuties (including rare reds) page. Tonka Truck is very playful with a very sweet, happy disposition. 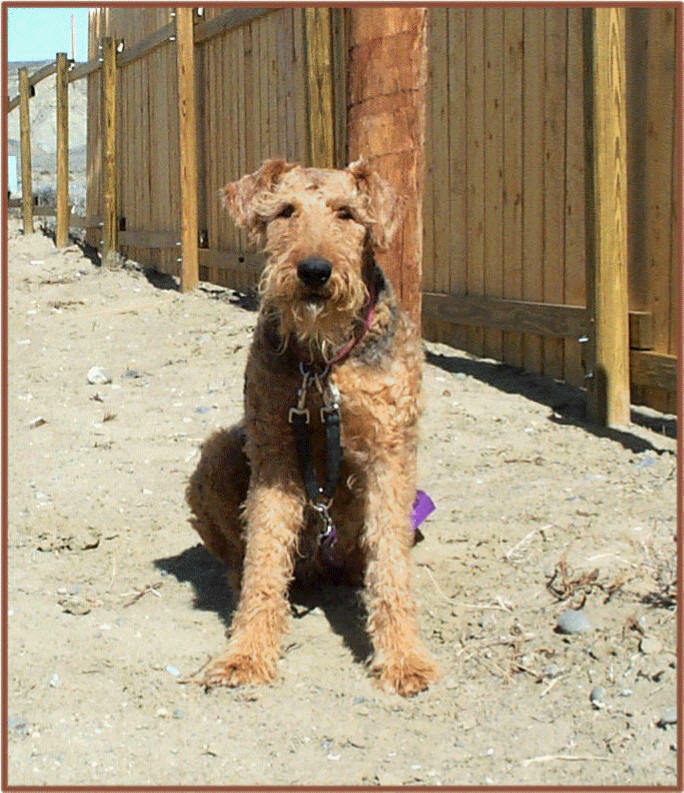 The red Airedale Terrier originated from some the oldest kennels in the US. Their red coloration ranges from a light red/tan to a deeper brownish red shade. Typically mellow in disposition, most of our red dogs possess very easy to maintain coats. 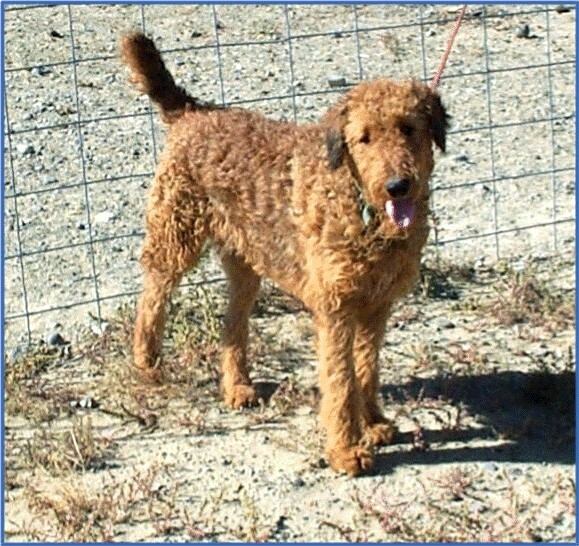 AKC will not accept the black or red Airedales on the basis of color so these dogs are registered through States Kennel Club (SKC), an international registry. 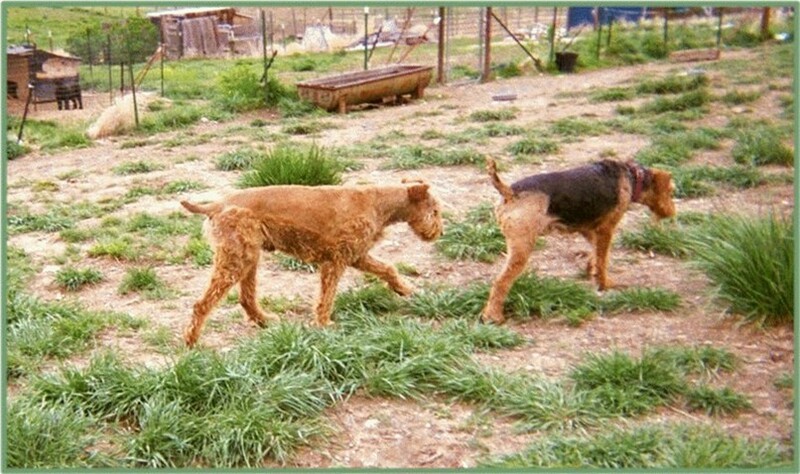 Our red Airedale line started in 2002 when Nevada Jake (red) and Fancy Girl were bred to produce our red line starting with Fancy's Red Jake. Sadly Red Jake is no longer with us, but his son Tonka Truck remains. 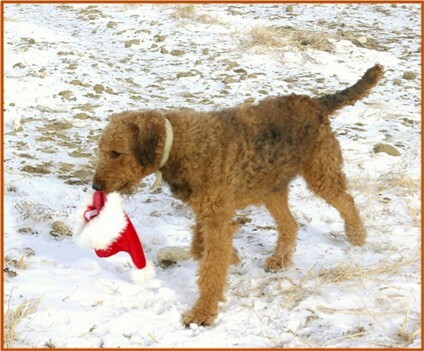 Like Red Jake, many of our red Airedales possess very easy to maintain coats. 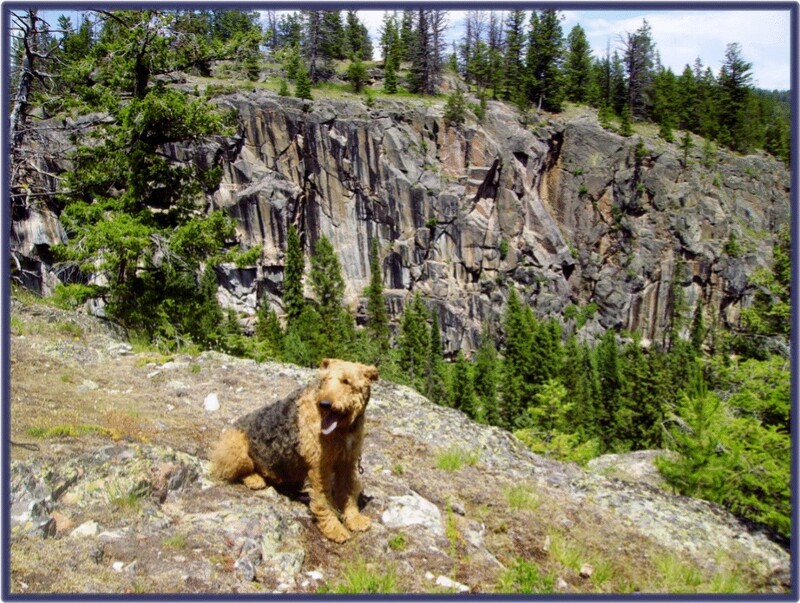 Photo Below of Nevada Jake (below left) and black & tan Airedale, Fancy Girl, the parents of Red Jake (Tonka's father) . 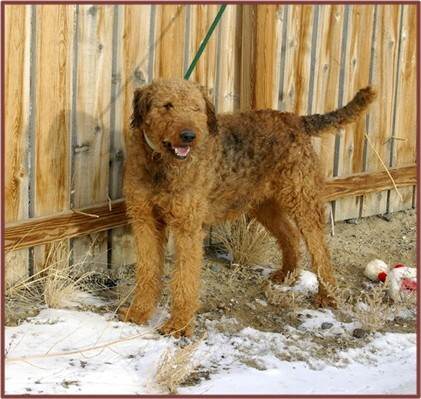 Weighing about 80 pounds, our large Airedale Fancy (left and below) is retired from breeding. Spayed, she will remain with us as a beloved housepet and companion for the remainder of her years. 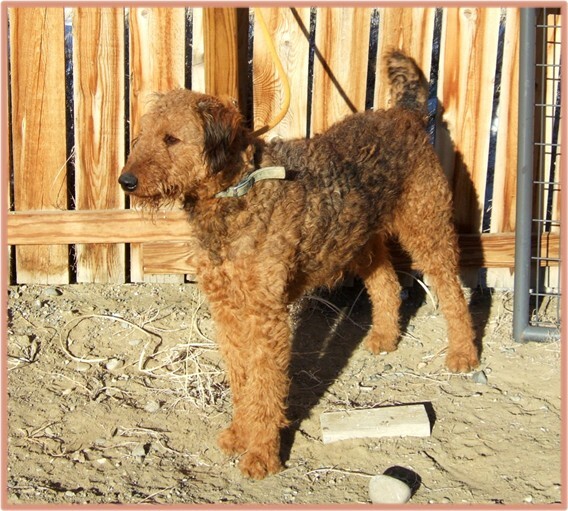 She is the grandmother of Tonka (red Airedale) and the great-grandmother of Black Magic on the Black Airedales page. Sadly no longer with us, Red Jake (left) was the father of Tonka (photo below and right). Born in 2002, he was a tall Airedale standing 31 inches at the shoulder. Red possessed a very happy and loving personality quite similar to that of his son Tonka (below). Tonka loves to play in water in warm weather. Each summer we fill up several small plastic pools for the him and water lovers to splash around in. Some of the Airedales initially try to scratch at the cartoon fish on the pool's bottom. Tonka's daughter Sunny (born in October of 2006) loves to stick her feet in the water buckets. Very sweet, Sunny is also a red Airedale. Please feel free to call us at 307 754-3426 or email airedale@tritel.net for additional information.